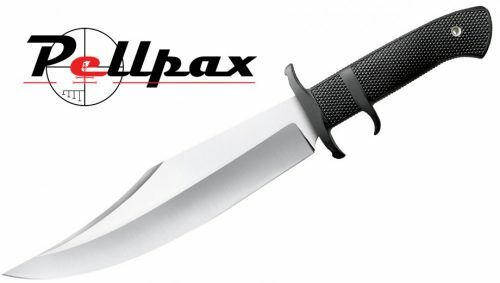 Home » Blades » Knives » Fixed Blade Knives » Cold Steel Marauder Fixed Blade Bowie Knife 9"
The Marauder is named after the Merrill's Marauders. These were a US special operations jungle warfare unit who were seen in the South East Asian conflict. Reliable, tough and has devastating effects the Marauder is a true battle weapon. The monstrous 9" blade is constructed using the top grade AUS 8A Stainless Steel. This is a very tough steel that can penetrate the hardest materials without taking damage itself. 8A stainless is known to be very easy to resharpen to the same standard as it came when new. This means the Marauder will be loyal and last you as long as you need it to. The 9" blade will give you a deep, easy penetration whilst causing devastating effect to the material with it's 4.7mm thickness. The acute cutting edge will slash,cut,slice or chop materials deeply. Designed to provide the user with comfort, control and the pure feeling of power the Kray-Ex handle is a key feature to this top end blade. The textured non-slip surface gives you the maximum amount of grip possible to ensure you can use this knife in the worst conditions and prevent the knife moving around in your hand causing inaccuracy or injury. Fitted with a hand guard, the Marauder is very safe to use and apply large forces with. The hand guard will prevent contact between this sharp blade and your hand/fingers so you can have peace of mind using it. This reliable high end blade is ready to take on your cutting job. The Marauder comes with a Secure-Ex sheath which not only allows you to take your blade anywhere with easy access, but also protects your blade when your not using it for those tough cutting jobs. Cold Steel Marauder Fixed Blade Bowie Knife 9"
Add this item to your basket & spend an extra £373.01 to apply for finance.